Whenever my body is in need of some comfort food, the first thing I start to crave is pasta. I could honestly eat pasta every single day – it’s just one of those staple things that I never get bored of! I love it so much. Luckily, it’s a food that’s incredibly adaptable, so you can always change it up and eat it in lots of different ways. Not only can you buy or make so many varieties of it, but you can also serve it with so many different things in lots of different ways. I think it has to be one of the most versatile foods we have. For me, the most comforting way to serve pasta is with a creamy sauce. Usually, when I’m at home I’ll enjoy cooking some up with a marinara sauce, some roasted vegetables or a creamy sauce. But ultimately, nothing beats the combination of a really rich, flavoursome creamy sauce and a huge serving of pasta. It instantly fills you up, and leaves both your mind and stomach feeling happy and satisfied. It’s just a dish that feels so nurturing to eat. Usually, when I make my creamy sauce I like to pair it with mushrooms as they add such a nice depth of flavour to the dish. Their savoury, earthy and slightly nutty flavour really merges well with the mild, delicate flavours of cream to create a perfectly balanced dish. Usually, I like to use Ecomil’s Almond Cream as it is so smooth, light and silky. 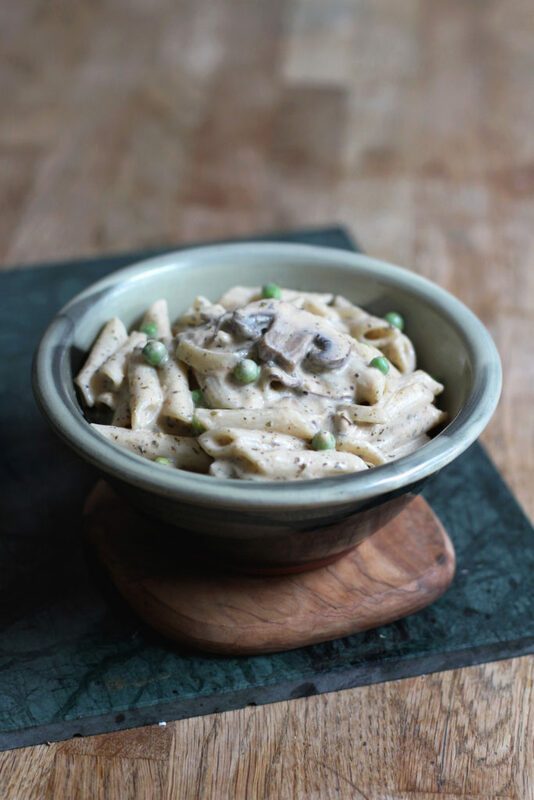 The company very kindly sent me some of their creams recently – and I knew I had to feature their Almond Cream in a recipe post for my mushroom penne! The texture of their Almond Cream makes the perfect replacement for dairy. It’s so smooth, and it has just the right consistency for a sauce like the one I made in this recipe. It’s so versatile, and I can’t wait to use it in more recipes on my blog! 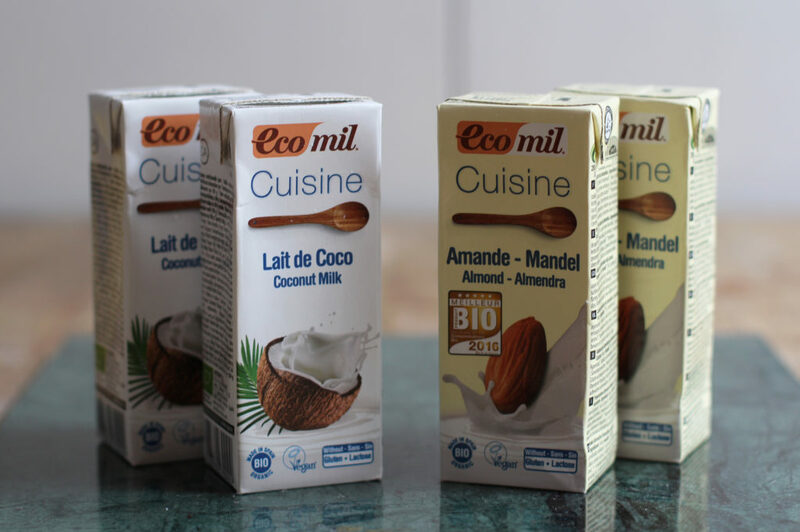 Their coconut cream is also really delicious, and I love adding it to my oatmeal in the mornings. Ecomil make such great quality, vegan products, and they’re a brand I know I can always rely on to make my food taste even better. Their cream really made this pasta dish special, so I hope you enjoy it! It’s such a simple dish to make, and the use of their ready made cream saves so much time – which is perfect for when you want to make a quick, delicious meal. The addition of paprika and chilli add a nice, subtle heat to the dish, and they really bring out the mushroom, garlic and lemon’s flavours. I added in a few pinches of each of the spices to the dish, until I was happy with the flavour. So just keep checking the sauce and how its flavours develop over the cooking time. The most important thing is that you use the ingredients in this recipe in a way that suits you, and makes a dish you love to eat! Firstly, add the vegan butter into a pan and place it onto a medium heat. Then, add in the onion and garlic, and fry for 2 minutes. When this is done, add in the mushrooms and fry for a further 2 minutes. Next, add in the almond cream, lemon juice, dried mixed herbs, vegetable stock powder, nutritional yeast flakes, salt, pepper, chilli and paprika. Stir everything together, and reduce the heat to a low-medium temperature. Continue to cook for 5 minutes. When 5 minutes have passed, fill a medium pan with water and bring it to a boil. Then, add in the Orgran pasta and cook it for about 8 minutes. During this time, stir the sauce and keep checking the flavour and consistency, to suit you. When there is about 1 minute left for the pasta to cook, add the peas into the pasta sauce, and stir. Then, when the pasta is ready, remove it from the heat, drain it and add it into the sauce. Lastly, stir everything together for about a minute or so, then remove it from the heat and serve. I love what you eat…always healthy and very delicious! I haven’t seen this almond cream before, but we need to start eating more vegan meals as my stomach is having issues with dairy. I will look out for these. Hehe! Definitely try it next time! Pasta is definitely one of the best comfort foods! Loving this one, Harriet! This looks super creamy and seriously dreamy, but I love that it’s also pretty healthy! Comfort food winning!! Cheers, girlie! yum yum, this is my favorite kind of pasta! so delicious! My mouth is watering and I think I’m going to have pasta for dinner tonight. I’m a big fan of mushrooms, they are rich and earthy the perfect pairing for a creamy pasta dish. Thanks for making this the healthy creamiest looking pesto recipe I’ve ever seen. Can’t wait to try it. Love all your healthy and delicious innovations, Harriet. And this one is no exception. Coconut milk addition to penne sounds cool! And love mushroom, so I am gonna try it. I hear ya…I could also eat pasta everyday 🙂 This looks delicious!! Thanks for sharing! You are so right, Harriet, sometimes a creamy dreamy bowl of pasta can work it’s magic on one’s body and soul! Love the addition of paprika in this – that subtle hint of heat ups the ante of this delicious dish! 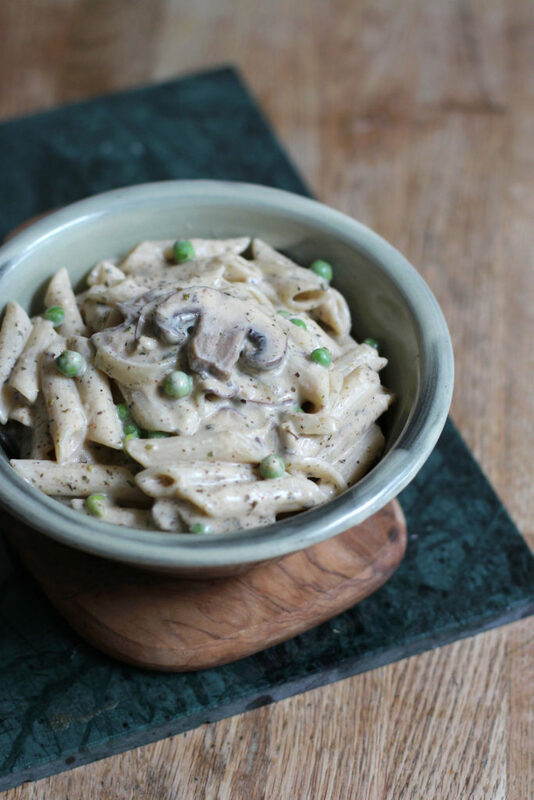 Creamy mushroom pasta is one of my favourite comfort foods. This looks delicious, Harriet! 🙂 Definitely going to try this soon! I agree, I could eat pasta everyday, it’s such a comfort food for me. This looks delicious, Harriet! 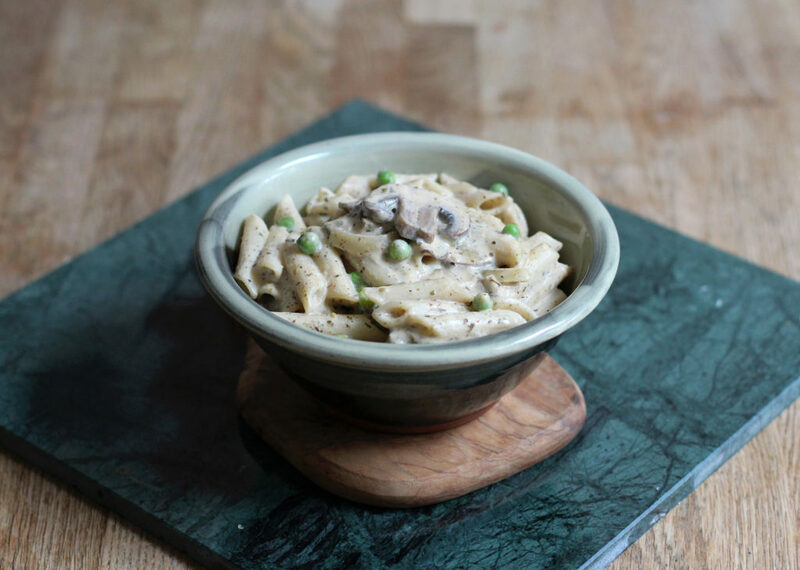 I’m loving the mushrooms and peas, and that creamy sauce looks divine. Yum, this pasta dish looks so creamy and delicious! It’s one of my favorite things to eat ever! So comforting and easy to throw together too! LOVE that you made this dairy free since most pasta dishes are full of cream and cheese! Can’t wait to try it! this looks SO creamy and delicious girl! I am loving this recipe 😉 I’m such a pasta girl I could eat it every single day! perfect recipe! This pasta dish is so creamy! And given my love for mushrooms I’ll have to try it. Thanks for the recipe.